Magyar Cserkészszövetség (Hungarian Scout Association), the primary national Scouting organization of Hungary, was founded in 1912, and became a member of the World Organization of the Scout Movement in 1922 and again after the rebirth of Scouting in the country in 1990. The coeducational Magyar Cserkészszövetség had 8,145 members in 2011. Another influence supporting the beginning of Scouting in Hungary was the youth magazine Zaszlónk ("Our Flag"). Hungarian Scouts worked closely with Austrian Scouts. In 1917 a Scout exhibition in Vienna was organized by the Hungarian and Austrian Scouts. :27 The Hungarian Scout Association was the Scout association for the Kingdom of Hungary (Transleithania), while the Österreichischer Pfadfinderbund was the association for Cisleithania. Hungary held its first National Jamboree in 1926 in Káposztásmegyer with 10.000 participants. The camp took place from July 9 to 23, 1926, and it was the only one between the two wars. :134 In 1928 Baden-Powell visited Hungary. :134–135 A few years later, Boy Scouts from all over the world gathered at the Fourth World Jamboree, held at Gödöllő, Hungary from August 2–13, 1933. Forty-six nations and territories were represented by 25,792 Scouts. They encamped around the Royal Palace in the Royal Forest of Gödöllő, about 11 miles from the capital of Budapest. The badge of the 4th World Scout Jamboree depicted the white stag of Hungarian mythology, the national symbol of Hungary and the official badge of the Jamboree. During World War II, Hungarian Scouts carried out many important roles, acting as messengers and other essential duties. Pál Teleki was called on once again to lead the nation as Prime Minister and Chief Scout of Hungary. Betrayed in his efforts to keep Hungary out of World War II, he committed suicide on April 3, 1941. He was succeeded as Chief Scout by General Kisbarnaki Ferenc Farkas, Commander of Royal Ludvokia Akademia. General Farkas remained Chief Scout of the Hungarian Scouts in Exile. In 1947 the Hungarian Scouts took part in the 6th World Scout Jamboree in France. :266:230 In 1945, after World War II, the Külföldi Magyar Cserkészszövetség (Hungarian Scout Association in Exteris), was first named the Teleki Pál Scout Association. It was soon renamed as the Hungarian Scout Association, and it became active in the displaced persons camps in Germany and Austria. :269–270 Béla H. Bánáthy was during World War II the voluntary national director for youth leadership development and a member of the National Council of the Hungarian Scout Association. He was instrumental in contacting the World Scouting Movement and organized Scouting in his camp southeast of Innsbruck, Austria, inside the French occupation zone. Zoltai Gogins organized Hungarian Scouting in the Feffernitz displaced persons camps near Graz in the British occupation zone. The Hungarian Scout Association in Exteris soon became active around the world. :269–273 The Magyar Cserkészszövetség in Exile preserved the traditions of Hungarian Scouting in exile and held contact with other Scout associations. In 1992, Dr. Béla H. Bánáthy, a long-standing member of the Hungarian Scout Association Abroad (Külföldi Magyar Cserkészszövetség), traveled from the Monterey, California in the United States to Hungary following its renewed freedom. Bánáthy had attended the 4th World Scout Jamboree held at Gödöllő in 1933. He later became personal friends with General Kisbarnaki Ferenc Farkas, Chief Scout of Hungary, and was also Director of Leadership Development at the Royal Ludovika Akademia for the Hungarian Boy Scout Association (Magyar Cserkészszövetség) during World War II. Bánáthy helped restart the Hungarian Scout Association. 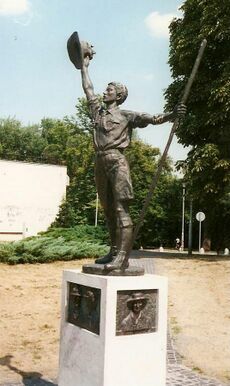 Statue of The Boy Scout erected in Gödöllő, Hungary to commemorate the tenth anniversary of the 1933 World Jamboree. In 1994, after democracy and Scouting was reestablished in Hungary, the community around Gödöllő moved to locate and re-erect a statue by Lőrinc Siklódi commemorating the 1933 World Jamboree. In 1943, on the tenth anniversary of the Jamboree, a statue of a Boy Scout was erected across from the Guard Barracks in Royal Forest of Gödöllő, Hungary. When Communist forces liberated the country from Nazi Germany, the original statue by sculptor Lőrinc Siklódi was removed as the government moved to suppress Scouting. After a long search, the original statue could not be found, and a committee was established with the purpose of erecting a new statue. They decided to enlarge Zsigmond Kisfaludi Strobl's 50 inches (130 cm) statuette entitled The Boy Scout. A student of Kisfaludi Strobl, István Pál, was chosen to complete the work. The new statue of a Boy Scout standing on the original pedestal is unveiled on April 23, 1994, commemorating yet again the 1933 World Jamboree. In 1991, 20 Scouts of the Magyar Cserkészszövetség participated in the World Jamboree in Korea; and in 1995, 70 Scouts represented Hungarian Scouting in the World Jamboree in the Netherlands. 90 Scouts represented Hungarian Scouting in the 19th World Jamboree and 565 Scouts, including 50 Hungarian Scouts from Transylvania, Slovakia, Ukraine, Serbia, Canada and the United States of America, represented Hungarian Scouting in the 21st World Scout Jamboree in England. :7 At the end of 2004, there were 7,198 registered members in all sections. At the end of 2008, there were 6,758 registered members in all sections. With the growth of Scouting in Hungary, changes to the organization include girl membership, who have their own patrols, and the expansion from towns into villages, allowing otherwise isolated children to participate. Prior to World War II, Magyar Cserkészszövetség groups were primarily hosted by schools, and today are more likely to be connected to a church parish. During the Communist period, Magyar Cserkészszövetség lost considerable property, but today owns two campsites near Budapest. :4 These are the Sztrilich Pál Cserkészpark and the Csobánkai Közép-európai Cserkészpark. The Scout Motto is Légy Résen, translating as Be Prepared in Hungarian. The noun for a single Scout in Hungarian is Cserkész. The membership badge of Magyar Cserkészszövetség features the Crown of Saint Stephen. There is also a Sea Scout programme. The Hungarian Scout Association is among other organizations member of the Ecumenical Council of Churches in Hungary. The Catholic Committee of the Hungarian Scout Association is a full member of the International Catholic Conference of Scouting (ICCS). For Hungarian Scouts internationally, the Külföldi Magyar Cserkészszövetség, or Hungarian Scout Association in Exteris serves them. The two internationally recognised Hungarian associations, the Scouts in Exteris and the minority associations are members of the International Forum of Hungarian Scouting. ↑ 4.0 4.1 4.2 4.3 4.4 4.5 4.6 4.7 4.8 Franz Harangozó (October 1957). "Aus der Pfadfinderwelt-50 Jahre Pfadfinder in Ungarn" (in German). Unser Ziel-Monatsschrift für Führer und Mitarbeiter (Pfadfinder Österreichs): 30–31. ↑ 5.0 5.1 Ziegler, Horst (1999) (in German). Die Geschichte der österreichischen Pfadfinderbewegung aus steirischer Sicht. Fürstenfeld: Pfadfinder und Pfadfinderinnen Österreichs-Landesverband Steiermark. ↑ 6.0 6.1 6.2 6.3 6.4 6.5 6.6 6.7 Michael Holzmann (2004). "EU-Erweiterung Die Neuen kommen-Ungarn" (in German). PPÖ-Brief (Pfadfinder und Pfadfinderinnen Österreichs) 1/2004: 7–8. ↑ 7.0 7.1 7.2 7.3 7.4 Pribich, Kurt (2004) (in German). Logbuch der Pfadfinderverbände in Österreich. Vienna: Pfadfinder-Gilde-Österreichs. pp. 9–10. ↑ 8.0 8.1 8.2 8.3 (in Hungarian) Száz éves a magyar cserkészet...a világot átfogó mozgalom!. Külföldi Magyar Cserkészszövetség. 2010. ↑ 9.0 9.1 9.2 9.3 9.4 9.5 9.6 Wilson, John S. (1959). Scouting Round the World (first ed.). London: Blandford Press. ↑ "Gilwell´s Fritz de Molnar Hall-An impressive Opening Ceremony". The Victorian Scout: 11. February 1964. ↑ "Aus der Pfadfinderwelt-Fritz von Molnar" (in German). Unser Ziel-Organ für Führer und Mitarbeiter der Pfadfinder Österreichs (Pfadfinder Österreichs): 140. September 1961. ↑ 12.00 12.01 12.02 12.03 12.04 12.05 12.06 12.07 12.08 12.09 12.10 12.11 12.12 12.13 12.14 12.15 12.16 12.17 12.18 12.19 12.20 12.21 Kroonenberg, Piet J. (1998). The Undaunted- The Survival and Revival of Scouting in Central and Eastern Europe. Geneva: Oriole International Publications. ISBN 2-88052-003-7. ↑ 14.0 14.1 14.2 14.3 14.4 14.5 14.6 14.7 14.8 About Hungarian Scouts in Exile kmcssz.org. Retrieved 2008-09-25. ↑ Lew Orans (1996-12-24). "Bela's Story: Scouting in Hungary, 1925-1937". http://www.pinetreeweb.com/bhb.htm. Retrieved 2008-08-12. ↑ WOSM (1990). Scouting ´Round the World. Geneva: Public Relations and Communications Department, World Scout Bureau. ISBN 2-88052-001-0. ↑ Saunders, Hilary St George (1948). "The Left Handshake, Chapter IV-RESOLUTION-Scouting in Occupied Countries: Part Seven—Greece, Yugoslavia and Hungary". http://www.pinetreeweb.com/left4-7.htm. Retrieved 2007-10-10. ↑ 18.0 18.1 Knobel, Bruno (1962) (in German). Das große Abenteuer Lord Baden-Powells (second ed.). Zürich: Polygraphischer Verlag Zürich. ↑ "Displaced Persons Camps in Austria, D-G". 2007-06-01. http://dpcamps.org/austriad-g.html. Retrieved 2009-09-17. ↑ 20.0 20.1 20.2 Philipp Lehar (2009). "Pfadfinderarbeit als Beitrag zur Integration?" (in German). PPÖ-Brief (Pfadfinder und Pfadfinderinnen Österreichs) 2/2009: 11. ↑ RM W.T. (September 1957). "Cserkész" (in German). Jugend am Lagerfeuer (JAL) (Pfadfinder Österreichs) 9/1957: 172. ↑ "Österreichs Beteiligung am JIM" (in German). Unser Ziel-Monatsschrift für Führer und Mitarbeiter (Pfadfinder Österreichs): 7. September 1957. ↑ Roland (1957). "An einem russischen Lagerfeuer" (in German). Jungenland (Christliche Pfadfinderschaft Deutschland) 10-11/1957: 223. ↑ 24.0 24.1 WOSM (1990). UPDATE -August 1990 Scouting ´Round the World. Geneva: Public Relations and Communications Department, World Scout Bureau. ↑ Joe St. Clair; Alan Miyamoto; Fran Peterson. "White Stag History Since 1933". http://www.whitestag.org/history/history.html. Retrieved 2008-10-22. ↑ Phelps, Brian; Alan Miyamoto; Fran Peterson (1998). "History Since 1933". http://www.whitestag.org/history/history.html. Retrieved 2008-08-17. ↑ "Participants of the 19th World Scout Jamboree (Scouts, Adult leaders, International Service Staff)". El Tali-Diario de Vida del Jamboree 1999 (19th World Scout Jamboree) 8: 7. 5 January 1999. ↑ 28.0 28.1 Magyar Cserkészszövetség (2007). Hungarian Scouting-WSJ 2007. Budapest. ↑ "Éves beszámoló 2008". Magyar Cserkészszövetség. http://www.mcssz.hu/wp-content/uploads/2009/06/eves_beszamolo_2008_medium.pdf. Retrieved 2009. ↑ International Committee of the Hungarian Scout Association. "About Hungarian Scouting". http://www.cserkesz.hu/okb/interfrm.php?page=/okb/pages/index.php?id=45&L=en. Retrieved 2008-09-25. ↑ "Accommodation near Budapest 45 min. far from the center of the city". http://www.cserkesz.hu/cserkeszpark/. Retrieved 2008-09-25. ↑ "Rólunk". http://csobanka.cserkeszpark.hu/. Retrieved 2008-09-25. ↑ "Ecumenical Council of Churches in Hungary". World Council of Churches. http://www.oikoumene.org/en/member-churches/regions/europe/hungary/ecch.html. Retrieved 2010-01-07. ↑ "CATHOLIC COMMITTEE OF THE HUNGARIAN SCOUT ASSOCIATION". International Conference of Catholic -European-Mediterranean Region. http://www.iccs-em.org/en/member-organisations/catholic-committee-hungarian-scout-association. Retrieved 2010-01-07. This page was last edited on 16 October 2016, at 17:33.